The USS Lapon was an attack submarine skippered by Capt. Whitey Mack of Cape Haze, Fla. in the early 1960's. She was the only sub in the US Navy equipped with a one-arm bandi next to the Coke machine. Its claim to fame was that Mack and his crew shadowed a new Yankee-Class Russian submarine underwater for 47 days to eavesdrop on its capabilities. Photo provided by Whitey Mack. This was Capt. 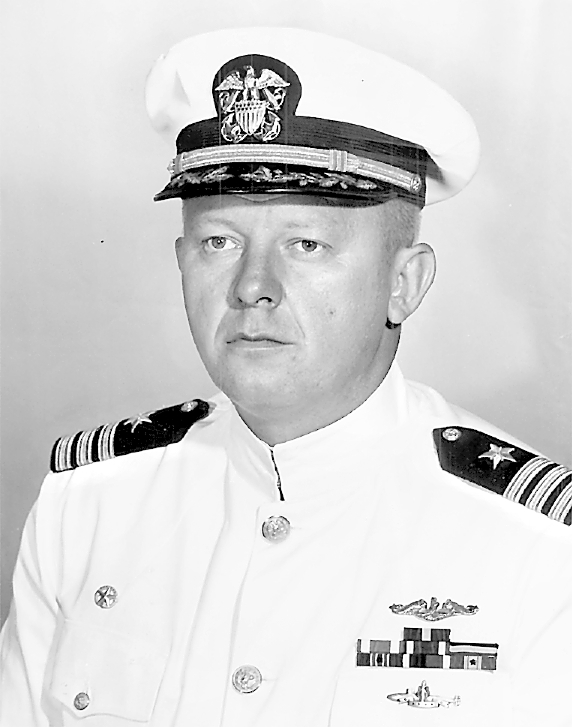 Whitey Mack when he commanded the atomic attack submarine USS Lapon. Chester M. “Whitey” Mack was skipper of the Lapon. 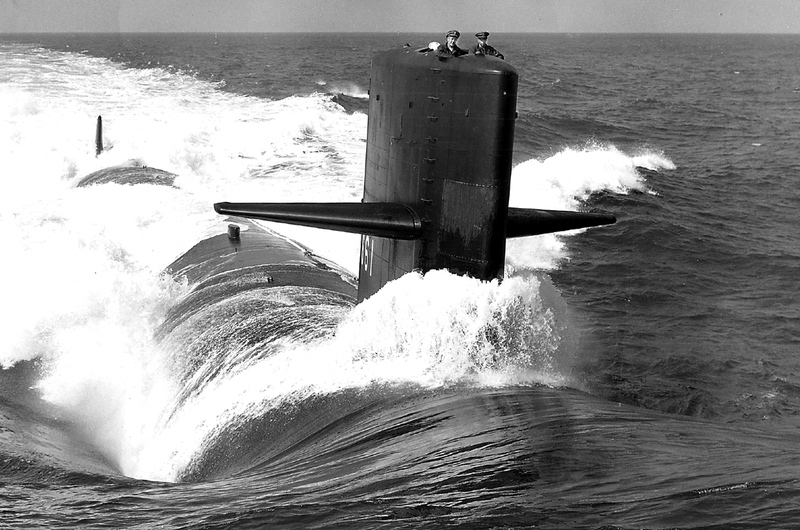 It may have been the sharpest submarine in the U.S. Navy when he was at the helm. Despite the fact his boat was named for the ugliest fish in the sea, Mack and his crew were good—they knew it. During the three years he skippered the Sturgeon Class atomic attack sub, it won every award the Navy gave for operational excellence. He was without a doubt the only submarine captain in anyone’s Navy who went to sea with a one-armed bandit on board. The slot machine stood next to the Coke machine on Lapon. The Navy’s top brass knew about it, but winked, Mack said. 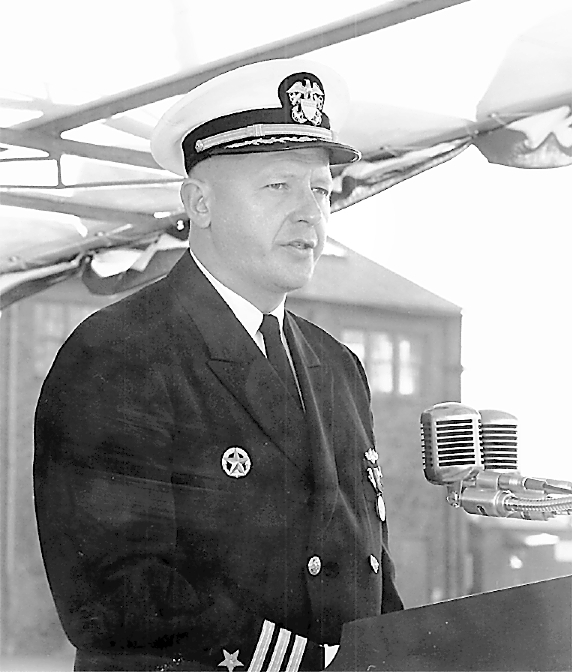 Mack tells a tale about Adm. Thomas Moorer, chief of naval operations, coming aboard the Lapon with a bevy of admirals in his wake to watch his attack sub and its crew in action during war games. “The chief of naval operations dropped down the hatch of my sub and went right to the one-armed bandit. He had two rolls of nickels in his pocket. He knew about the slot machine,” Mack said. “That slot machine paid for every ship’s party we ever had,” Mack said. He was a precocious kid and a brilliant college student. In sixth grade his teacher taught the class how to speed read. When he graduated from college in 1953 the Korean War was still going on. Just before graduation the ROTC executive officer talked to him about his future and his military commitment. “Whitey, you ever thought about how long it’s going to take you to dig a foxhole big enough to cover your backside if you go in the Army? In the Navy, we sleep between clean, white sheets,” he said. Mack thought that was a “pretty compelling argument.” He signed for a three year hitch in the Navy. He went to Officer’s Candidate School after scoring among the top 1 percent of all of those who took the entrance exam. After graduation, he was posted to a destroyer. It was his kind of job—scientific and technical. He learned what made a destroyer tick through a lot of reading and on-the-job training. Near the end of his three year enlistment, he got a call from a Navy captain who ordered him to Washington, D.C. He had an interview with Adm. Hyman Rickover, the father of the nuclear Navy. “The typical interview with Rickover was about a minute. You’d walk in and he’d throw you out,” Mack said. “When I walked in, he gave me a rash of stuff like you wouldn’t believe for an hour and 15 minutes,” Mack recalled. “I gave it right back to him,” Mack said. He hired the young naval officer afterward. The USS Lapon was an attack submarine skippered by Capt. Whitey Mack of Cape Haze, Fla. in the early 1960’s. She was the only sub in the US Navy equipped with a one-arm bandi next to the Coke machine. Its claim to fame was that Mack and his crew shadowed a new Yankee-Class Russian submarine underwater for 47 days to eavesdrop on its capabilities. Photo provided by Whitey Mack. Despite the fact Mack wasn’t an Annapolis graduate, eight years later he went aboard the Lapon as its skipper. He had served on several other nuclear submarines as head of every department in the ship before being given command of a nuclear attack sub. The 36-year-old lieutenant commander was a stickler for training and preparedness aboard ship. When he took command of the Lapon, he began a training program for the entire crew. Mack credits his crew with being a major reason for much of Lapon’s success while he was skipper. It wasn’t all sweat and drills aboard his sub. The crew’s favorite port of call was Fort Lauderdale. One time, a couple of Lapon’s chiefs, who had had a bit too much to drink, decided to remove a big, hairy, fake gorilla holding a tire mounted on a telephone pole in front of a tire store in Fort Lauderdale. They thought the gorilla would make a nice addition aboard the submarine. “So the chiefs were there on each other’s shoulders trying to unbolt the gorilla from the pole when a couple of cops come along in a cruiser,” he said. The chiefs decided to play a few round of “Would you believe” with the cops. “Would you believe we’re trying to feed him?” on of the chiefs said to the cops. “We don’t think so,” they replied..
“Would you believe we’re trying to put him back?” the sailors asked. “Doubtful,” came the officers’ reply. The policemen were breaking up with laughter. They told the chiefs to tighten up the nuts that held the gorilla on the pole and come with them. Then they took them back to the ship. After the cops deposited the chiefs at the submarine, they returned to the station and told their story about the two sailors trying to make off with the gorilla. A newspaper reporter overheard the tale. Their story was published in the local paper. In 1969, the Soviets launched their Yankee-Class nuclear missile submarine. It was a huge technical advancement for the Soviet Navy. The 429-foot-long, 9,600 ton sub carried 24 nuclear missiles capable of hitting many major cities in the United States. The most worrisome thing about the technically advanced sub was its stealth ability. Mack’s bosses in the Pentagon wanted to know a lot more about the submarine. How quick was the Yankee? Could it be tracked by U.S. Navy sonar? What was the capability of its missiles? Mack and his crews, along with other U.S. submarines, were sent to sea to find out. Lapon headed for the Barents Sea, the front door to the Russian Navy’s northern fleet. A short time later, Lapon went back to sea searching for another Yankee Class sub to follow to get more information on it. By chance, they picked up a Yankee on the sonar and began shadowing the sub. Then they lost the Russian sub because it was so quiet. Mack and his crew did some scientific guesswork about where the sub might go. They were correct. The second time they found it, they stayed on its tail. “The admiral running the sub was a victim of his own meticulousness,” Mack said. Every 90 minutes he changed course. Every night at midnight, he went to periscope depth to look around. Every day he dumped the garbage at the same time. “Halfway through their surveillance of the enemy sub, Lapon went to periscope depth to communicate with a patrol plane and let their superiors know they were still tailing the Russian sub. Unfortunately, a Navy aviation admiral accidentally leaked the information that Lapon was following the Soviet sub. This information was picked up by a New York Times reporter. When the story made headlines, the Russians relayed it to the admiral in command of the sub. “When he found out, he went nuts,” Mack said. “For 24 hours he did every kind of maneuver you could imagine. He was obviously looking for us. For 47 days they trailed the Russian sub. Both submarines were in the Atlantic, submerged 1,800 miles off the U.S. Coast. The Lapon crew gathered extremely valuable information about the capabilities of the other side’s latest potential threat to the United States. It was the height of the Cold War, and this information was more valuable than gold to the U.S. Navy. In August 1970 the Navy Times carried a story saying the nuclear attack submarine Lapon had been awarded the Presidential Unit Commendation for “extraordinary heroism” for its part in the surveillance of the Russian missile sub. 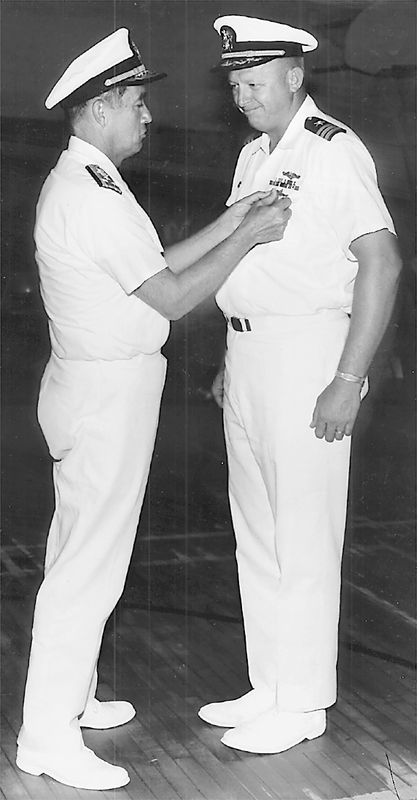 Mack received the Distinguished Service Medal for his role as skipper of the Lapon. It was the highest peace-time award the Navy could give him. Mack was only the fifth commander to ever get the medal. It’s generally reserved for senior admirals. Commendations: Lapon received a Presidential Unit Citation for shadowing a Russian submarine underwater for 47 days; he was awarded the Distinguished Service Medal as skipper of the boat. Children: Karen Mack, Valerie Sadler and Brian. This story was first published in the Charlotte Sun newspaper, Port Charlotte, Fla. in 2003 and is republished with permission. Capt. Whitey Mack, former skipper of the atomic attack submarine USS Lapon who lives in Englewood, is a legend in his own time. So much so that BBC Radio came calling. The radio reporter wanted to hear some of Mack’s submarine stories. It seems the BBC staff is collecting a series of stories from submarine sailors in many navies around the world. Mack regaled the British Broadcasting Company reporter with a story about putting a one-armed bandit beside the Coke machine aboard Lapon. It seems Mack’s slot machine was well known at naval headquarters. One day Mack recalled, “Adm. Thomas Moorer, chief of naval operations, dropped down the hatch of my sub and went right to the one-armed bandit. He had two rolls of nickels in his pocket and started feeding the machine.” He winked at the sub captain when he left his boat. Then there’s the one about the two Navy chiefs who got drunk one night and tried to unbolt a huge fake gorilla from a signpost outside a tire store in Ft. Lauderdale. They got caught by the cops and their story ended up on the front page of the local newspaper. But the most important story they were told by the fabled submarine skipper was the time, in 1969, he and his sub trailed a new Yankee-class, Russian-made, state-of-the-art atomic sub for 47 days without detection. Not only was this an incredible feat of seamanship, but it was very important to the U.S. Navy to discover it could track a new, stealthy Russian sub underwater. For this feat, Mack received the Distinguished Service Medal, the highest peace-time award. The crew of Lapon received a Presidential Unit Citation for “extraordinary heroism” for the part they played in the surveillance. Mack’s war stories were taped by the BBC at Radio Station WENG in Englewood. As a consequence, operations manager Scott Holcomb will put Mack on the air live with his war tales this coming Monday. He will appear on “The Monday Magazine,” the show Holcomb hosts, from 9 a.m. to 11 a.m. on Radio Station WENG 1530 AM. Listeners are invited to call the station at (941) 460-1530 and talk to the submarine skipper on the air. Chester M. “Whitey” Mack, 77, of Englewood, Fla., passed away Thursday, Sept. 25, 2008. He was born July 20, 1931, in Glen Lyon, Pa.
Whitey and his beloved wife, Joan, moved to Englewood in 1995 from North, Va. He was a highly decorated U.S. Navy captain with 20 years of service. He had a chemical engineering degree from Penn State, and master’s degree in international law from Georgetown University. He was a member of the American Legion, Military Officers Association of America of Sarasota, Fla., and the USS Lapon Association; and a life member of U.S. Submarine Veterans. 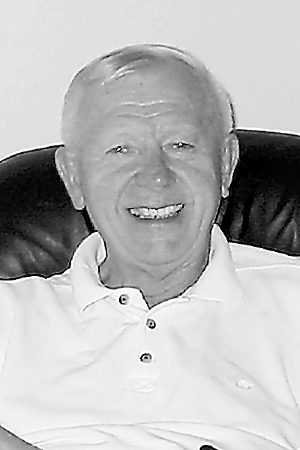 Whitey will be greatly missed by his wife of 53 years, Joan; daughters, Karen Mack of Montclair, N.J., and Valerie (Mark) Sadler of Odessa, Fla.; son, Brian (Karen) Mack of Louisa, Va.; three grandchildren, Victoria Rose, Kristen Nicole and Brianna Leigh; brother, Simon Makarewicz of Virginia; and sister, Barbara Makarewicz of Pennsylvania. In lieu of flowers, contributions may be made to TideWell Hospice and Palliative Care, 12050 N. Access Road, Port Charlotte, FL 33981. Arrangements were made in Port Charlotte, Fla.
My brother served on this Sub. I was very proud to serve with Whitey Mack. Even when he painted my nose blue and shaved my head during the ships BLU-NOSE initiation.